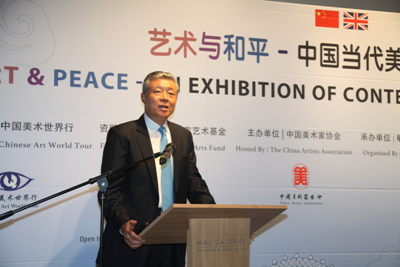 It gives me real pleasure to join you for the opening in London of the "Art & Peace - An Exhibition of Contemporary Chinese Art". This is part of the China Arts World Tour. I would like to begin by extending my warm congratulations on the opening of the exhibition. I also want to thank the Mall Gallery for hosting this wonderful exhibition. For the first time, this exhibition brings to Britain contemporary Chinese art works that had been the highlights of the Beijing International Art Biennale exhibitions from 2003-2015. Under the theme of "Art and Peace", this exhibition will be an art gala for building friendship and peace. It has three-fold significance. First, the art works represent the Chinese people's keen aspiration for peace. The Chinese is a peace-loving nation. "In the application of the rites, peace and harmony is of the highest value." "Heaven rewards those who love each other and do each other good." For the Chinese nation, the pursuit of peace, concord, and harmony is a way of life. It is in our blood and soul. It is at the heart of Chinese culture. And it is an unchanged theme for generations of Chinese artists. The "Art & Peace" exhibition covers various kinds of artistic works, including ink painting, oil painting, wood block prints, sculptures, etc. These works showcase China's traditions and modernity, and the harmonious co-existence between man and the nature. They are meant to extol life and the nature, and to express the Chinese people's love and pursuit of peace. Second, today's event reflects the common wish of humanity for lasting peace in the world. When we look at the world today, we see peace remain unachieved in many regions. We see a complicated and changing international landscape. We see global problems propping up one after another. We see uncertainties and instabilities on the rise. It is against such a background that the "Art & Peace" exhibition is coming to London. Through a rich variety of artistic expressions, this exhibition emphasizes China's commitment to building a community of shared future for mankind. It conveys a profound reflection by Chinese artists and their aspiration for world peace and development. It is a worthwhile attempt at interpreting the tireless pursuit of humanity for lasting peace in the world. I believe that viewers visiting this exhibition will gain a deeper understanding about the value of peace, about the healing power of art and about the importance for humanity to pursue and uphold peace together. Third, the event today adds new highlight to the broad cultural and people-to-people exchanges between China and Britain. This year marks the 45th anniversary of the Ambassadorial diplomatic ties between our two countries. It is also a year for consolidating the China-UK Golden Era. In such an important year we are very happy that the China Artists Association is bringing its finest collections to London. This exhibition and the seminar you are going to hold for academic exchanges will contribute to the overall China-UK cultural ties and people-to-people bond. They will promote the exchanges and mutual learning between Chinese and British artists, and help them build consensus. 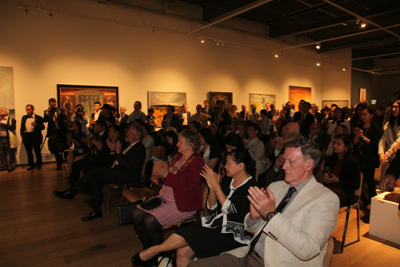 They will display the charm of the contemporary Chinese art to the British public. They will bridge the hearts of our two peoples and increase the friendship and mutual understanding. Finally, they will reinforce our joint efforts to build a world of harmony and a world of lasting peace. In conclusion, I wish the "Art & Peace" exhibition a complete success!